Claws are a vital part of a cat’s anatomy, essential to balance, protection, mobility, and survival. It is normal for cats to scratch thing to mark their territory as well as to trim their claws. Scratching, playing, climbing, and kneading are all pleasurable activities for cats. But, some people may not find these activities acceptable inside the home. 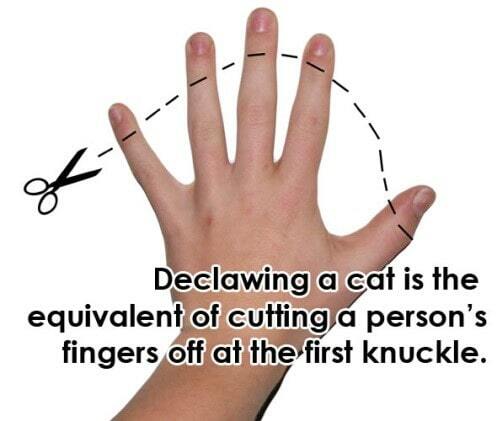 Declawing is a very serious and invasive surgery. The last bone and joint of your cat’s toe has to be amputated to eliminate the entire claw. It is a painful surgery with an excruciating recovery period. This drastically alters the conformation of their feet and the cat is deprived of its natural ability to defend themselves from the outside prey. Some of the problems that may occur after surgery can be physical, emotional or behavioral. Balance problems may result when the cat begins standing differently to compensate for the loss of parts of his toes. The weakening of the shoulders and upper back can develop when cats can no longer scratch properly. Medical drawbacks can include pain, infection, tissue necrosis, lameness, or discomfort while walking. Many people declaw their cats for their own convenience without realizing what it actually does to their body. Declawing is deemed as “inhumane” and an “unnecessary mutilation”. In the United Kingdom and 20 plus countries, it is illegal or only acceptable under extreme circumstances. The American Veterinary Medical Association and the American Animal Hospital Association now recommends that veterinarians counsel clients in all the alternatives to declawing. It is helpful to start training your cat to not destroy the furniture as young as eight weeks. To teach kittens that a scratching post is better alternative, you can use clicker training, treats, or a simple pet when it uses the scratching post. You can also train older cats who are treat motivated, but you may need to pair it with another alternative such as a repellent. Spray-on antiperspirants or citrus scents can repel cats from scratching on your furniture. Marking the scratching post with treats or catnip can distract them from ruining other parts of your house. People have even used double stick tape, aluminum foil, plastic, or balloons to cover the undesirable scratching area. You can trim your cat’s claws with a clipper or have a veterinarian trim them to make their claws less destructible. This is another alternative that should be started early to make it a positive experience. After you are finished clipping the nails, your cat should get treats to reward him or her. Click here for a tutorial. 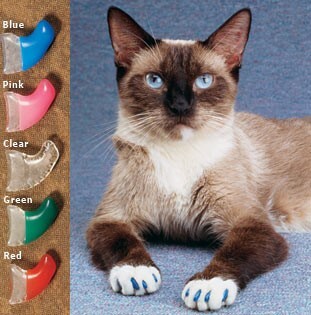 Soft Paws® are a non-toxic, safe cover for cat’s nails that come in all sorts of colors and sizes! They come with adhesive and many covers for more than one use and have been proven to prevent any scratching. For more information on Soft Paws®, click here.